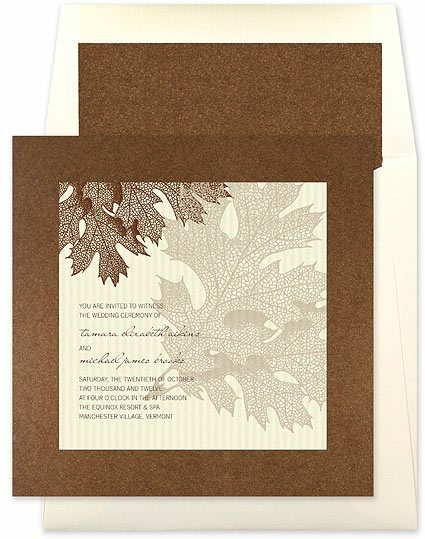 For our Fall wedding this past October, we ordered our invitations from Elegant Bridal Invitations, owned and operated by Julie Bernard, a longtime advertiser with Top Wedding Sites (since it’s inception in 2000). The overall experience was great, as expected. 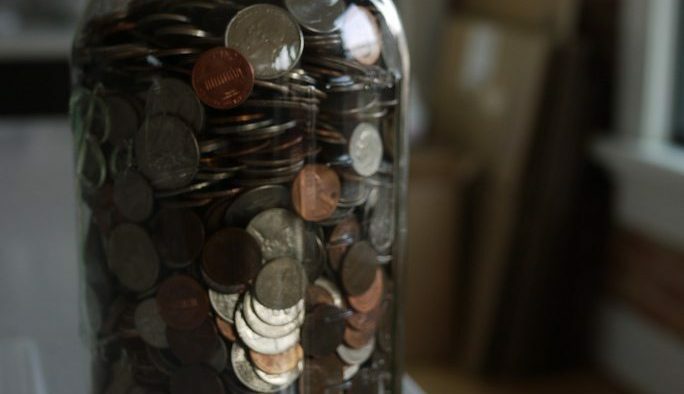 But there were some surprises…read on. Since our wedding was taking place in the Fall, we selected the Oak by Checkerboard. The actual invitation was fantastic (but it wasn’t exactly cheap). The invitations were printed on heavy cardstock and felt substantial, and the design was layered, clean, and complex without being over the top. Leanne and I are pretty simple people, so it suited us and our personalities. We had ordered a few sample invitations online so that we could get an idea of the paper. This one didn’t have the feel of a cheaper quality stationary, and was very well crafted. Because the site allows you to redesign all of the text, we were not limited to a certain format and could end up writing whatever we wanted. While the ending result was exactly what we had pictured, it wasn’t that easy to get there. I spent a few hours fiddling with the spacing, length of lines, and font sizes just to get the formatting where we wanted it. This is in addition to the obvious font, color, and design choices you have to make with any sort of custom invitation. But in the end, it turned out great and it was well worth the effort. Julie offers highly personalized service and was extremely helpful in walking me through how to use the site (which isn’t obviously user-friendly). She proofread the final copy to make sure everything was correct, and even helped tweak some of the spacing that I was struggling with. She also gave me accurate forecasts of how long things would take to create, and what it would cost. We actually got the invitations back to us rather quickly; only took a couple weeks at most. There were plenty of other invitations (types and designs), though we limited our selection to our autumn themed genre of invitations. Outside of our parameters there were many choices, and they even had a few others that would have fit our specific theme. We received lots of compliments about the invitations, which I found surprising. Sure, people always say how nice everything is and yada yada, but they went out of their way to say how much they thought about the invitation in particular. Elegant and classy were the words that really stuck out. Big talk for just invitations; I don’t think anyone said anything that nice about the way I looked in my suit that day or anything like that – hahha. I’ll give it to you, Mom, that using the fountain pen instead of printing out addresses on the envelopes was a good idea. I’m glad we did it, though writing the addresses and creating the guidelines on the envelopes was THE most tedious, pain-staking task in the entire wedding process. In the end I think it really added to the overall impression the invitations made, and all it cost was a lot of time, and 20 bucks for a pen and ink. Lastly, it was really awesome that we were able to get our invitations, the envelopes, all the inserts, table cards, and thank yous in one place. I was able to completely re-design some of the inserts to what I needed too, using the same customization process. We used insert cards to provide information on our wedding website, the menu choices (which we needed ahead of time), and RSVP cards. They matched the invitation and instead of taking away from the package, it added to it. This way we avoided putting registry cards in the envelopes, which I felt was really tacky and presumptuous. And the Thank You cards were great quality too, with appropriate envelopes, which gave us one less thing to worry about. 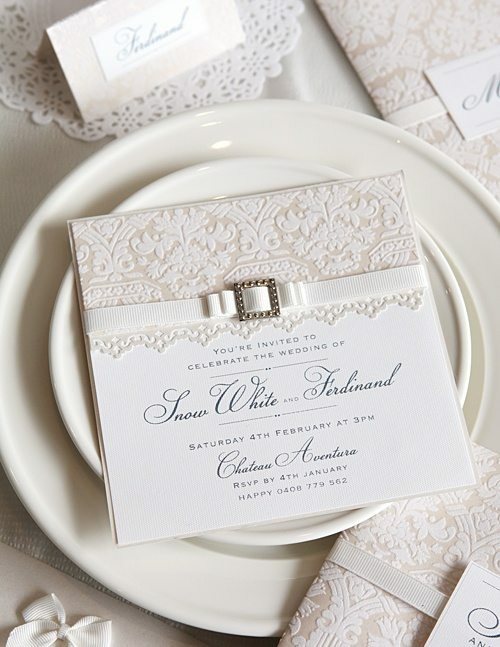 I can certainly see why Elegant Bridal Invitations has been in business for so long! 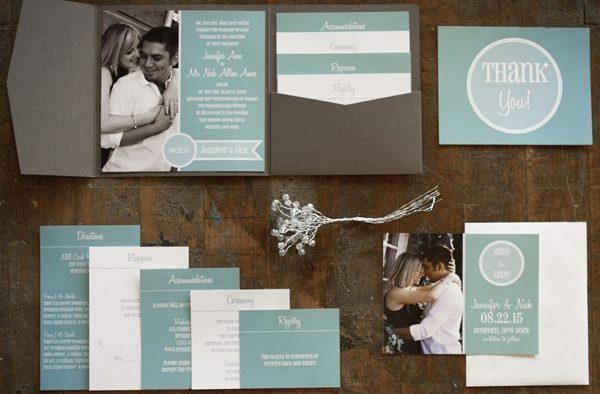 Do you have a wedding invitation shopping experience to share? Post it below.